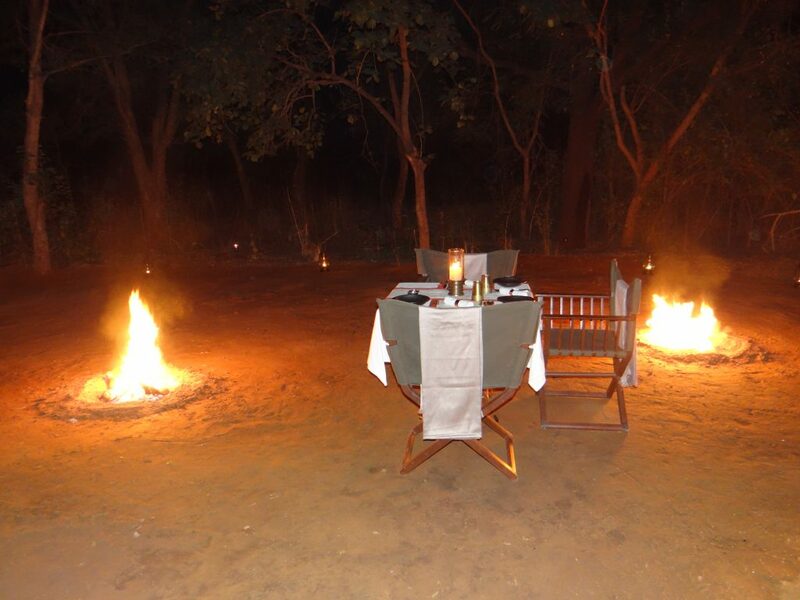 Aman I Khas : A haven where wildlife & 7-star luxury, embrace effortlessly. When our vehicle came to a halt, 10-staff from the camp, were waiting to greet us. Having stayed at Aman Bagh in 2016, we were kind of prepared for this grand welcome, but even then, were surprised by the immense warmth shown to us by the staff, who in unison, greeted us with a ‘Namaste’, the traditional Indian salutation. 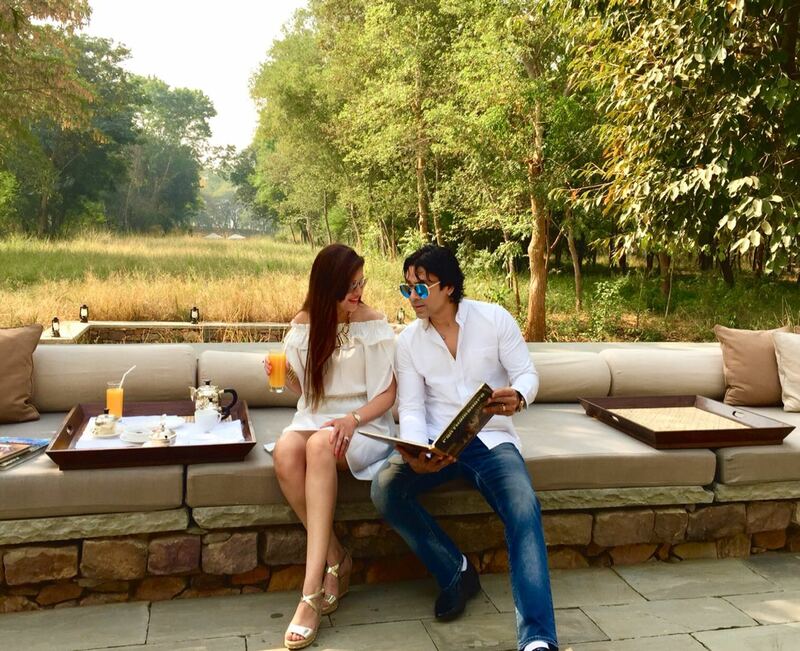 Anand Shekawat, the young, dynamic, effervescent and charming young General Manager of the Aman-I-Khas, introduced us to our batman (butler) and together they walked with us into the magnificent and luxurious wildlife camp grounds. Our first impression was one of appreciation as the tented camp was elegantly spread out and the ten tents gave us the feeling of being in a safari outpost of a brushwood forest. Our batman, Bijoy, showed us to our tent, which had a distinct mix of a colonial and Mughal feel to it and was grand and luxurious in a rather rustic way. ‘Aman’ in Sanskrit means peace and ‘Khas’ in Urdu means privileged. Before we saw the interiors of our tent, we were not so sure about the choice of name for the camp, but now we were clear about how aptly the place had been christened, for it was truly a privilege to be staying at a place as peaceful as this marvellous tent, with a canopy which soared six meters high. 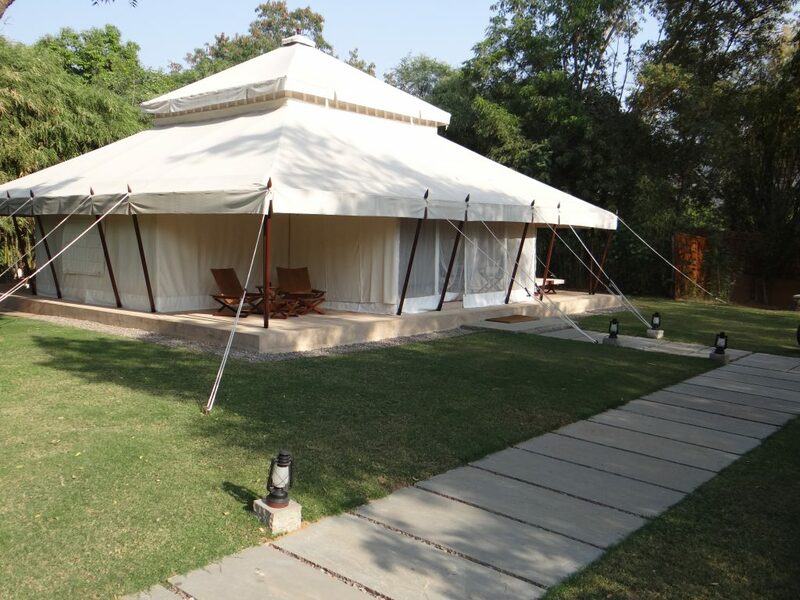 The vastness of the tent encapsulated our sense of luxury, as delicately draped screens of fine cotton separated sections of our abode in the wilderness, into different areas for sleeping, dressing, bathing and living, with provisions made for every amenity needed by a guest. Something, which Aman, as a signature hotel brand, does so effortlessly. When we stepped out for lunch, Bijoy, led the way to a table set for two, below the shade of a tree. The temperature was very pleasant, despite the time of day. All of the other tents were booked by a group of ladies, who we were told, were from a Middle Eastern family of royals. They greeted us and spoke about how much they had loved being pampered, the signature way, by the fantastic team at Aman. They even told us that we should be prepared to be amazed over the next 3 days of our stay and it all started, with the fabulous lunch, Chef RamKesh cooked up that afternoon. We returned to our room to relax for a while before our planned camel ride along the foot of the Aravallis, just minutes away from the park which was home to tigers, gazelles, sloth bears, leopards, spotted deer and scores of a variety of bird species. Sajjid Mitha & Laveena Mitha enjoying camel ride. We mounted our camels and rode across the countryside of Sawai Madhapore. Our camels walked past grazing deer and wild boar. After an hour’s ride, at the foot of a small hill, we dismounted from the gentle beasts and trekked to the top, where a surprise awaited us. Bijoy, our batman, had set up tables overlooking a valley and asked us to be seated. We were first served some fresh juice and were offered an Indian snack to feast on. While we relaxed and clicked some wonderful photographs of Langur monkeys playing about in the valley, Anand, the GM, arrived at this marvellous spot and captivated us with his stories about the magnificent Tiger and the animal which he said was both feared and admired. He said that the tiger was a protected species and since 1973, Project Tiger, created by the Indian government, guaranteed the safety of the animal. We were lucky to have got many more beautiful pictures of the sunset, while we sipped on a delicious Indian wine, which was perfectly chilled and paired well with the deep fried pakodas. On our way back to our luxury camp, Anand pointed out the sambar and spotted deer and we were also lucky to have seen an owl, a sandpiper and a great crested grebe. When we arrived at the hotel, the staff, in their crisp uniforms and with the traditional namaste gesture were waiting to greet us. Magically, our batman Bijoy was also in the line up. We were offered two cold fragrant hand towels and a fresh juice and were told that dinner would be served to us in the forest. When we returned to our tent, our laundry was neatly folded and placed in a shallow wicker basket from where it went directly into the cupboard. What I love about the Aman, is that the laundry is included in your tariff and even if you place a pair of socks in the laundry basket, the room service staff will have it picked, laundered and returned in a few hours. Later, dressed for an adventurous dinner in the jungle, we stepped out of the tent and were directed through the property by Bijoy. 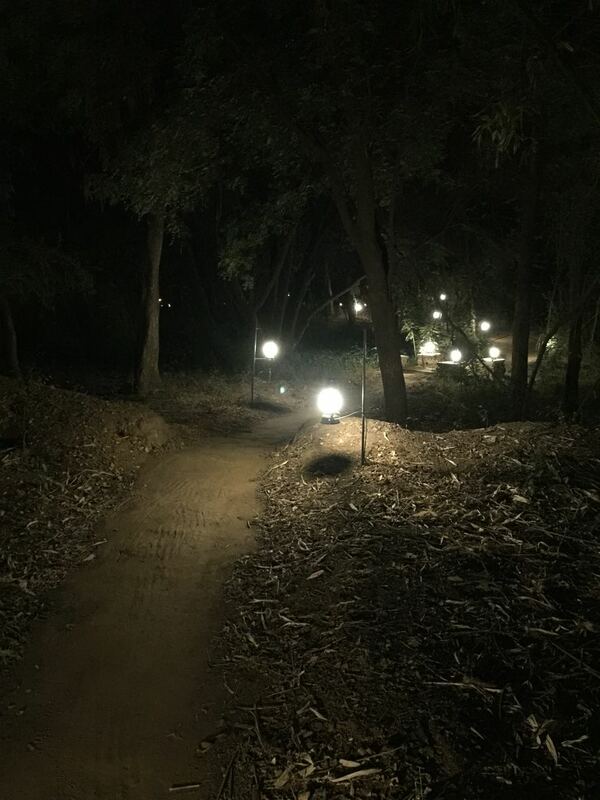 When we walked to the periphery of the camp, near to where the furthermost resident tent stood, Bijoy guided us further into the wild shrubbery, along a winding, man-made path, lit by kerosene filled lamps. We soon came upon a clearing with a table set up, surrounded by four burning bonfires and a kitchenette made out of baked mud. Fresh vegetables in baskets were neatly laid out while Chef Ramkesh was lighting up the wood to begin cooking. He said that all of the vegetables he would use for dinner that evening, were picked from the gardens of Aman-I-Khas and we would taste the organic freshness in the food we would be served. The menu was elaborate, the setting beyond romantic and the meats we were treated to, were soft, tender and delicious. And yes, we could actually taste the freshness of the produce so tastefully put together by our Chef. On our way back to our tent, we had our batman Bijoy and camp security, light our way through the wild shrubs. Very early the next morning, we set out on a safari, with expert naturalist Pankaj who works closely with the Aman-I-Khas. 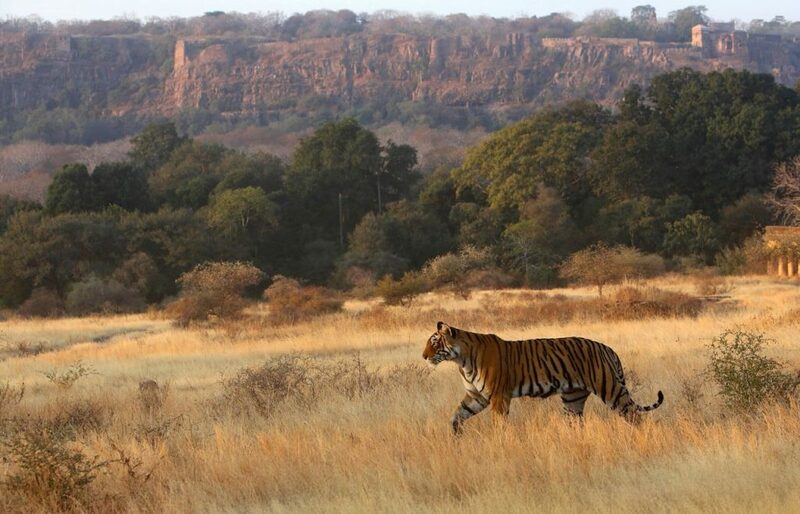 A private jeep drove us into Zone 5 at the famed Ranthambore Tiger Reserve. 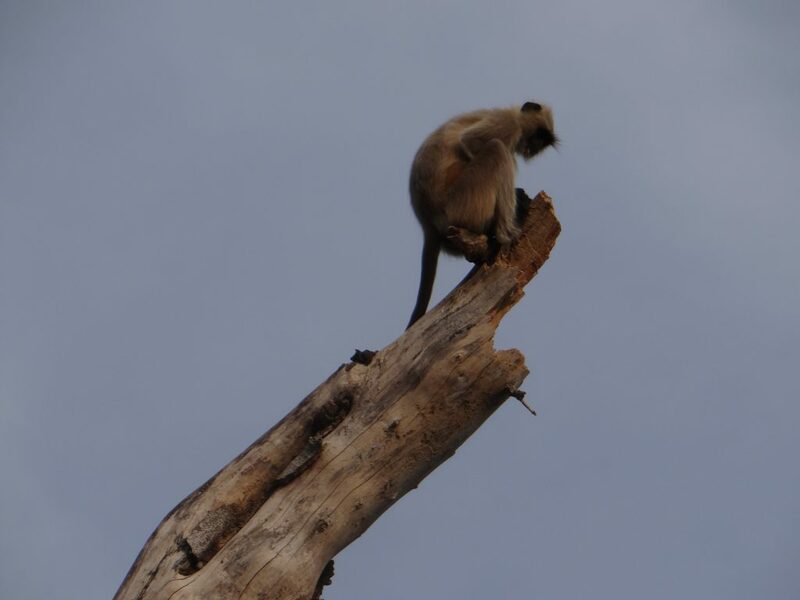 Within minutes of driving through dense foliage and rough terrain on a cold December morning, we spotted the Sambhar deer, the common and Hanuman Langur, Indian Wild Boar, Chinkara, and the Fivestriped Palm Squirrel. However it was the Tiger we were eagerly on the look-out for. After bouncing around in our adventure jeep for well over an hour, Pankaj tried to keep up our enthusiasm by saying that this past week had reports of a number of Tiger sightings. Pankaj explained that the Tiger was a solitary being and that despite them being reclusive, he was hopeful of a sighting. 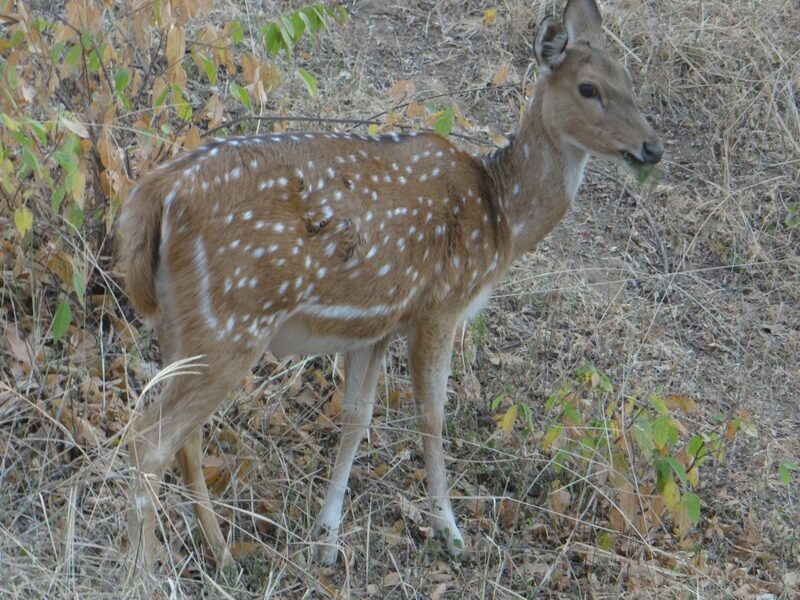 While pointing out different bird species to us, Pankaj suddenly alerted us to an alarm call of the Sambhar Deer. He asked me to get my camera ready as he said that a Tiger was nearby. Our driver slowed down as the warning call of the Sambhar grew louder . And suddenly, the majestic striped beast appeared through the thick bushes. Regal and confident, without a care in the world, she halted in front of our jeep. A sudden rush of adrenalin reminded me that I needed to capture this on my camera. Rather than photograph this incredible sight, I began to shoot a video. The Tigress stood there almost like she was posing for a shot when suddenly there was another warning call, which got her to turn around to look in the direction of the Sambhar. She then walked up to a tree and marked her territory, after which she looked in our direction. The magnificent Tigress yawned gallantly, turned and gracefully walked away into the shrubbery. It was then that Pankaj informed us that her name was ‘Arrowhead’. That moment will forever be etched in our minds, as this grand courtly sighting was most refined and stately, as we came so close to the royal beast of the jungle and our respect for the Tiger grew manifold. Sajjid Mitha & Laveena Mitha having breakfast near the pond. We returned to the camp elated. Word of the Tiger sighting had already reached the staff at Aman, who with happy faces, welcomed us back. They congratulated us and Anand said that in celebration, he had a post breakfast morning planned for us at the Spa. Breakfast was not at the dining tent, but was instead set up privately, by the pond on this fabulous Aman property. 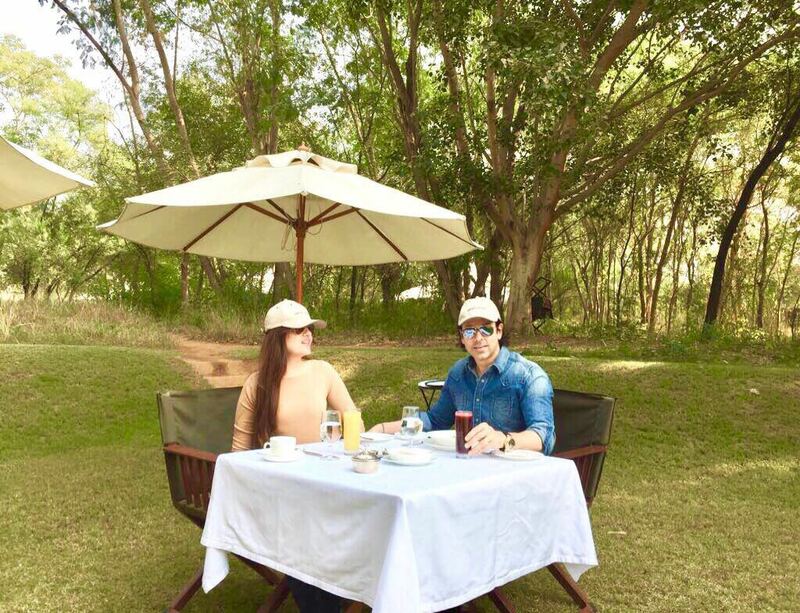 A lavish spread of fresh fruit, fruit juices, muffins and croissants, crisp dosas and free range eggs cooked to perfection were served to us as we sat back underneath the sun umbrellas and feasted. Our batman Bijoy told us that until recently, the pond was home to two crocodiles, however since the monsoons across the state of Rajasthan were weak this year, the pond was comparatively shallow and the crocodiles abandoned it for another. Bijoy walked us to the Wellness Spa well in time for our morning massage. From a list of holistic therapies, we chose our preferred services and for the next 90 minutes, Laveena and I traveled on a multi sensory journey of immense healing and gentleness, a massage which helped revitalise us and feel brand new. Elated we returned to our room to rest and read. When we re-looked at the video of the Tigress ‘Arrowhead’, we realised how fortunate and lucky we were to have chanced upon this regal and majestic being, thanks to Project Tiger. 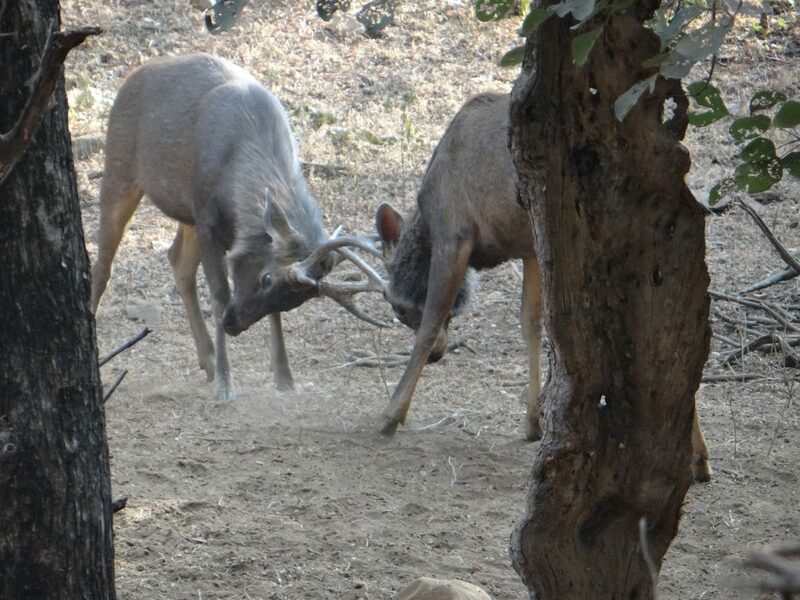 We had a morning visit planned to the Ranthambore fort the next day. At around 4:45 am that morning, the camp General Manager Anand, called out hastily to us from the entrance of our tent. We jumped out of bed wondering if we were late for our fort visit, but realised that it was dark outside. I asked what the matter was and Anand asked us to hurry as a Tigress was seen near the camp. In under a minute we dressed and stepped out into the bitter cold and followed Anand into a waiting jeep. We raced to the spot where Ramkesh the Chef was waiting with a spotlight pointed in the direction of the beautiful Tigress. She was known as ‘Lightning’, Arrowhead’s sister. This was our second sighting in less than 24 hours. ‘Lightning’, was just as majestic as her sister and equally as awe-inspiring and regal. We couldn’t thank Anand enough for having taken the trouble to wake us to ensure we enjoyed this sighting, so close to home. He later told us that the camera traps laid out on the periphery of our camp had alerted the security of her entry into Aman-I-Khas. Her pug marks showed that she had infact walked right past our tent. Fascinated with the thought of how close we had been to the magnificent Tigress in her surrounding, we returned to the camp by 6 am and were soon ready to drive to the Ranthambore Fort, a UNESCO World Heritage Site. When we arrived at the Fort, our driver Jagdish walked us in a direction, away from where the other tourists were headed. I thought to myself that he may have preferred to start the tour from a different place, in an effort to make it more private. We followed him through arched doorways of what looked like a dilapidated section of a fort. We walked up a flight of steps and ‘voila’, almost by magic, our batman Bijoy, who had bid us goodbye at the camp, was waiting to welcome us. Beautifully laid out on a picnic mat was cutlery and crockery for breakfast with breathtaking views of Lake Padam. In our picnic basket were warm croissants, cookies, fruit and sandwiches with fresh juice and a flask of hot coffee. 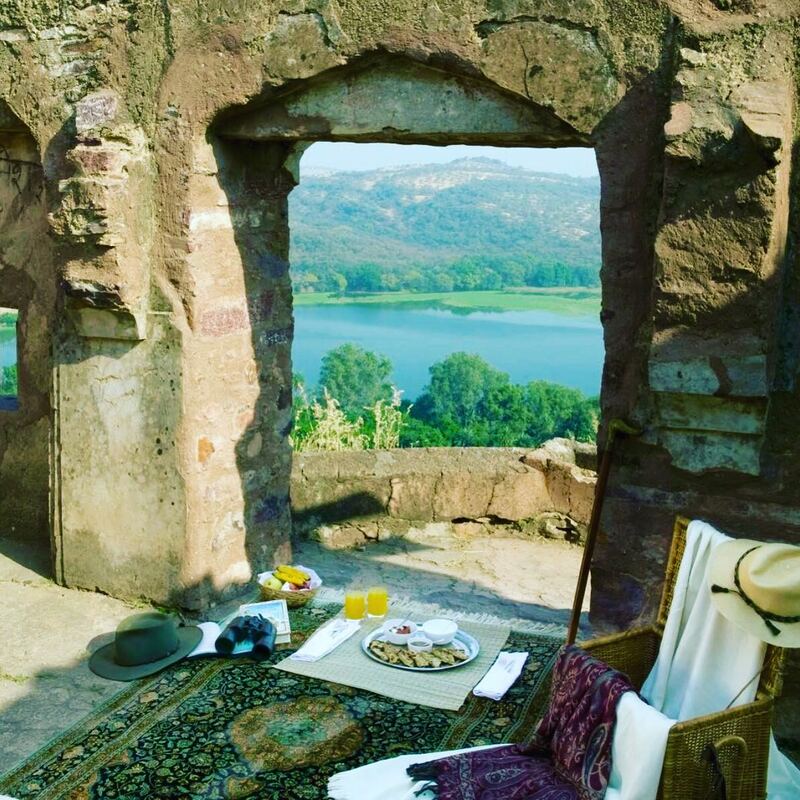 We loved the uniqueness of this romantic setting and enjoyed the very private breakfast at the fort. When we returned to the camp, our batman Bijoy was waiting to greet us along with other staff from Aman. By now we had stopped wondering how our batman could be in two places at the same time and how he would miraculously appear everywhere. We were even more convinced about the magic carpet and agreed that no one could do it like the Aman did. By noon, it was time for us to bid adieu to all who we had grown so fond of in the short time spent at Aman-I-Khas. We left with a heavy heart but with happy memories which would last us a life time. The Aman as a brand stands tall above the rest, hard to equal, given the sheer sincerity of their service commitments and their constant efforts to make guests feel special. 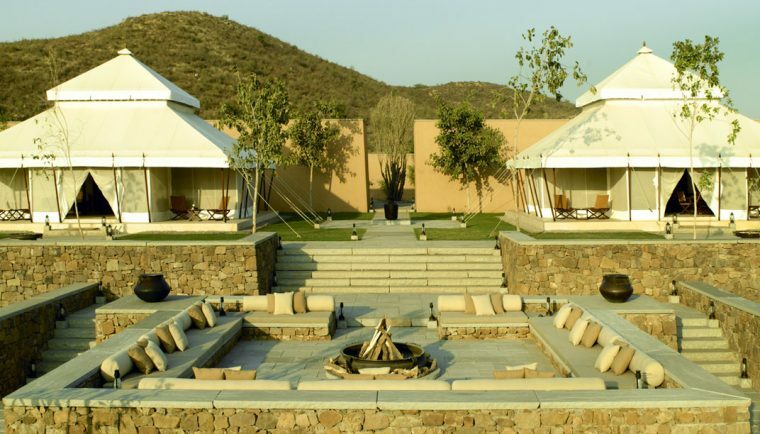 Laveena and I can’t wait to return to the Aman-I-Khas, although this time, we believe a magic carpet will be arranged to transport us from Mumbai, directly into the comforts of the grand luxury tent, we had come to love so dearly. Just enchanted…! Sounds like a fairy tale…!!! 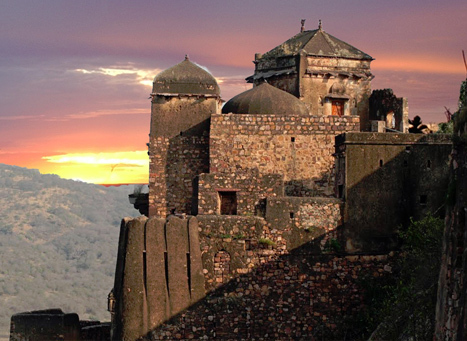 The beautiful blessing which comes along with a fairy tale like experience like at the Aman-I-Khas, is that you can go on re-living it over and over again. 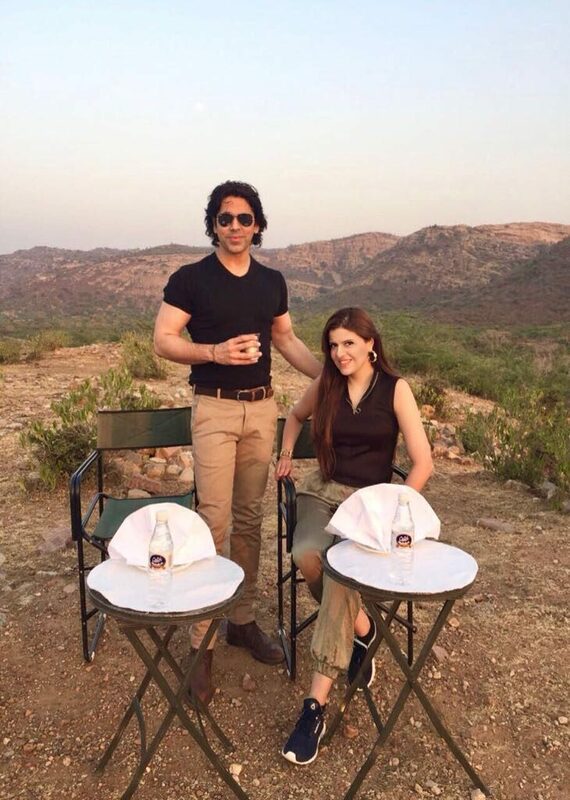 Both Laveena and I were indeed enchanted with our stay at this magnificent property and cannot wait to return. Hi Daren. Paula and you will absolutely love the Aman-I-Khas. It’s an experience worth taking a flight for. Truly. 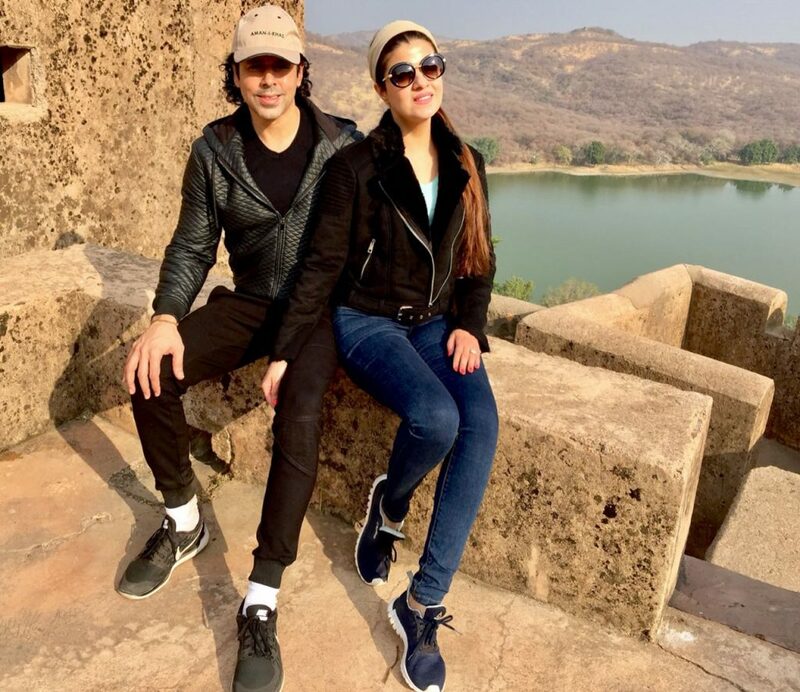 You are such an adorable couple and thank you for gracing us with your presence at Aman-i-Khas, we loved your presence and company during your short stay and thank you for awarding us with such beautiful words. We love you both and hope we get to see you again soon. We miss our Aman-i-Khas family and are waiting to return. A very big hello and an equally big hug from us. I read your article with great relish! It really took me back . I truly believe that Aman-I-Khas delivers one of the World’s best hospitality experiences and you are so right to point out that it is due to the amazing team who have dedicated their professional lives to it and also Anand’s stewardship and Management. Have heard so much about you and knowing that you have read my feature on the amazing Aman-i-Khas is indeed a very big honour for me as a writer. Travelmango, has over 50,000 HNI followers from across South Asia and the Middle East and I am pleased to share that by now I consider us as ‘travel influencers’ as many of our readers follow us to the destinations we feature on travelmango. Do keep in touch.